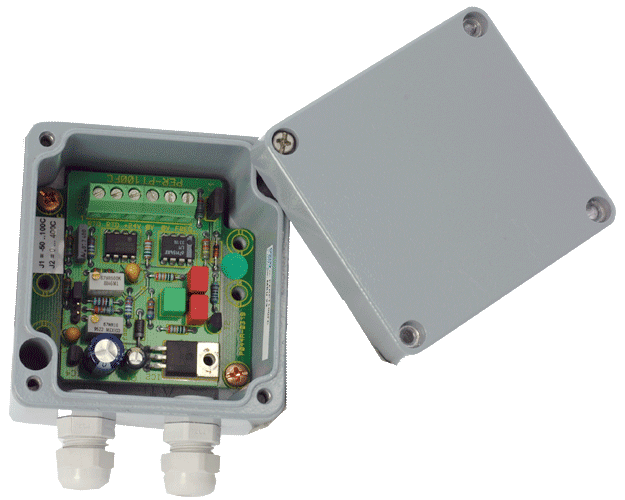 PT100 RTD remote signal conditioning unit with 24V frequency output. 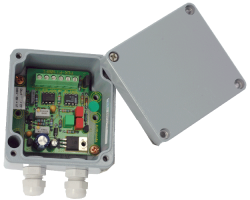 For applications requiring a few Pt100 RTD inputs it is often cheaper to use a frequency input than an analog input. PT100/FC converts a Pt100 input span of -50..100°C into a frequency of 500 to 8000Hz (50Hz/°C). A 0..400°C version is available. The output drives a 24V optocoupler input. The circuit comes in a 8x8 cm waterproof ( IP65) housing with two cable feedthroughs PG7.